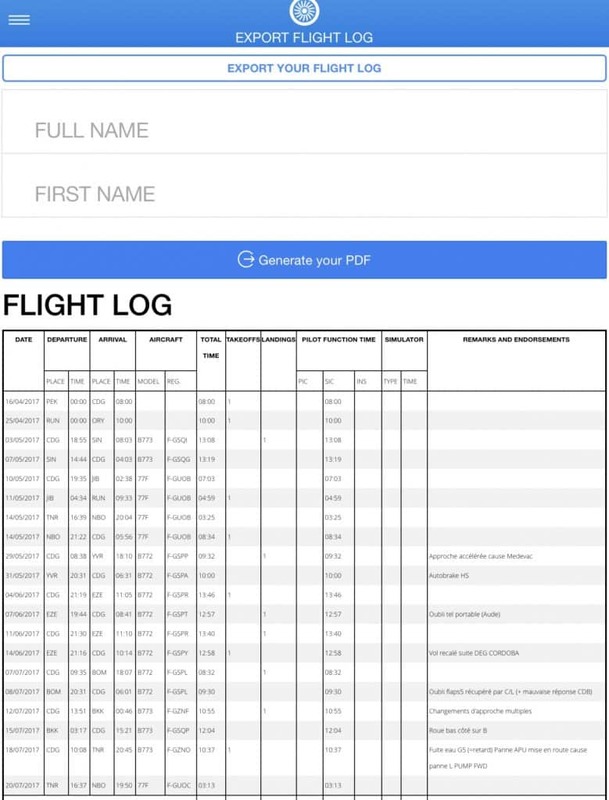 FlightLog is the most complete pilot logbook software for iPhone, iPad, and Android. More of a logbook, it comes with a lot of tools for airline pilots, professional pilots, and private pilots too. For Free.In 1 click you can import your roster (flights are auto-populated), and once your flight is done, with 1 click your times are auto filled... nothing to do ! You can import flights from your roster. Some airlines are fully compatible with FlightLog : Air France, Transavia, Iberia, HOP!, Air New Zealand. FlightLog is also compatible with RosterBuster. All your flights are displayed under My Flights tab. 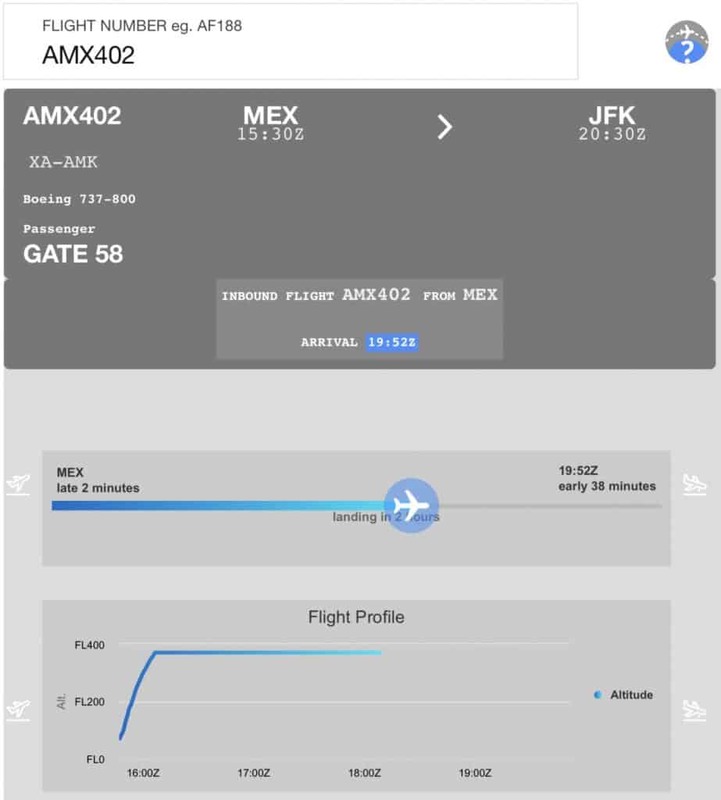 airline logos are automatically displayed according to your flight number. on large screen devices you can see how many take-off and landing you made per flight. a magnify icon is used to filter displayed flights. You can search ALL within your database (crew name, tail number, flight number, personal note, type of approach... all that you may have filled). By taping on a flight title bar, you open the concerned flight window. tCO2 which is the total CO2 emitted (Greenhouse gases emission for Jet A/A1 and also CO2 emitted in petrol extraction). By taping this field you'll have a popup with these two values differentiated. Click on AIRCRAFT field and select your aircraft in the dropdown list. If your tail doesn't appear, press the + icon and add a new tailnumber. You can also use the search bar on top to help you finding your aircraft. It's also possible to locate your aircraft like Flightradar24. the app will use the ADS-B network to find where is your aircraft and will display the inbound flight and ETA. You can change your origin and destination by taping the airport fields. By taping this icon you will get the weather forecast (general conditions and temperature) for this location and scheduled time. Weather is downloadable 72h before flight. Taping on this icon will switch °C and °F. You can edit your scheduled departure and arrival time. By taping this icon you'll open a popup where you can display the calculated sunrise/sunset and moonrise/moonset times. 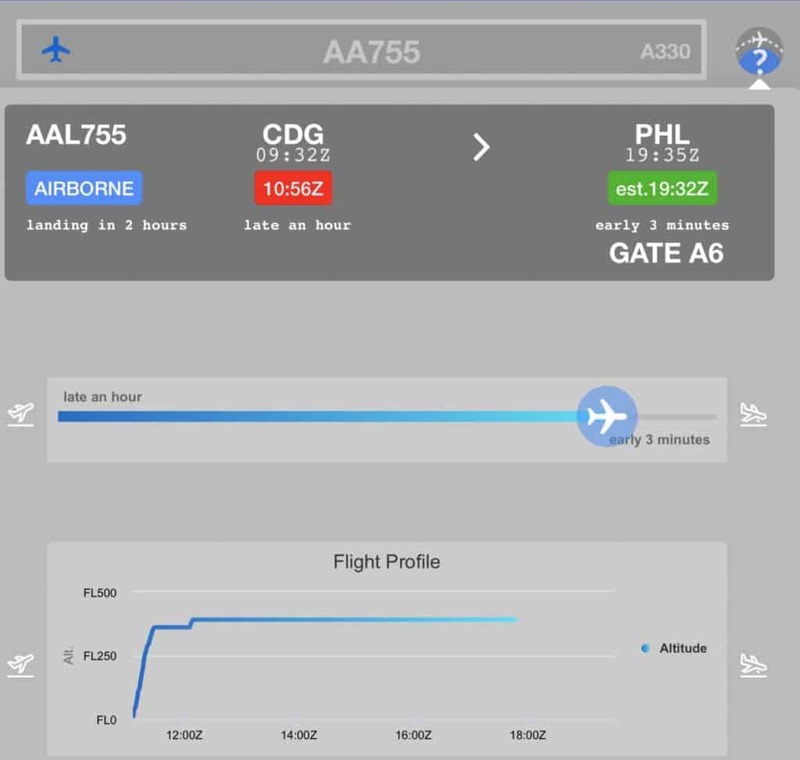 The times are precalculated as the popup window shows, with scheduled flight time. Then you can choose between SCHED / GPS / MANUAL. Uses your device's GPS data. May be inaccurate within a cockpit. If no location acquired, the system uses values Alt.30000ft / Spd 400kts. This is the more accurate way to compute the sunrise time. The computation is running, between your position (or WPT) and destination, flying along a Great Circle. 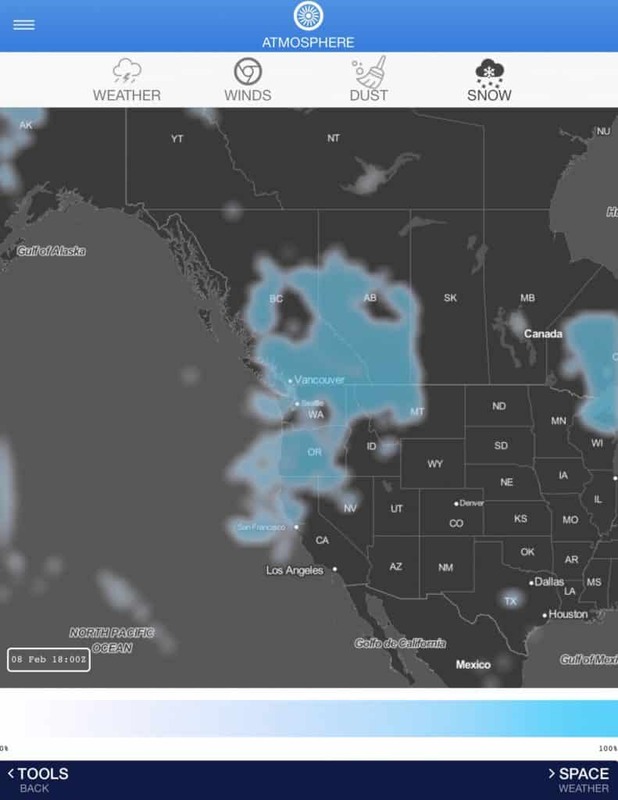 The sunrise position and time will be displayed on the map. Tap on the event or the Moon icon to see details. Track in black is night, yellow is day. The calculation is taking into account the altitude and speed of course, but also the atmosphere refraction. By taping the button NORTHERN LIGHTS within the SUNRISE window, you'll access to a map showing your flight and your chances of seeing an aurora. (NOT AVAILABLE ON ANDROID) The current Kp is the planetary index calculated by the NOAA. by taping on SUNRISE icon then ATMOSPHERE button you'll see your flight plan within a WINDS (surface) map. 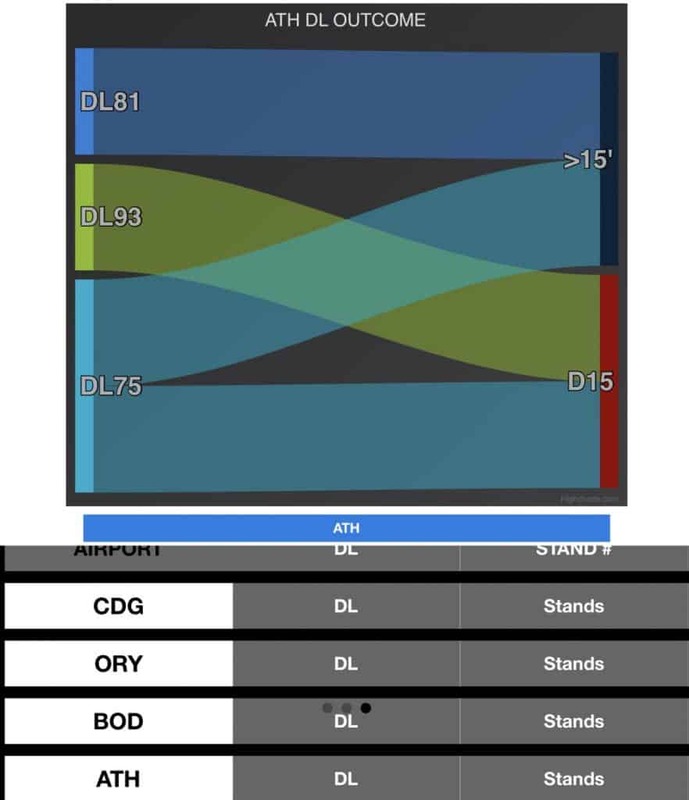 Your flight is truncated into several segments for which a best ground speed FL is computed, taking into account all winds at FL between FL150 and FL450. 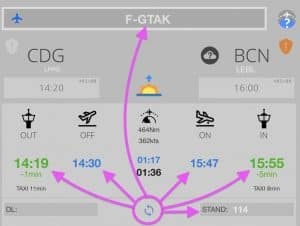 Here you can edit your flight times : OUT - OFF - ON - IN. By taping on any TIME field you'll edit the value. 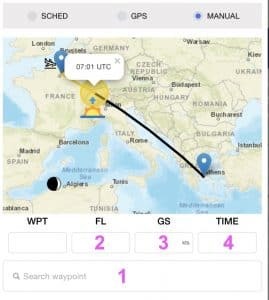 Taxi time and flight time (airborne and block) are automatically computed. Average delay for this flight number are available by clicking on the update icon (see below). 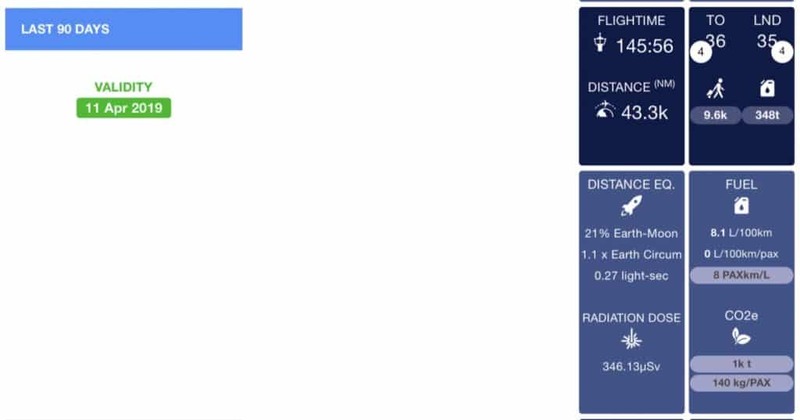 By activating VFR/IFR,NIGHT into Settings page, you'll have also a NIGHT field to manually edit. By clicking these icons you'll access to the general Airport delay Status. You may know by this way if you are likely to hold on destination (or departure). Here you can insert your DL code. Below will be displayed the IATA signification. By taping on this title, you'll have a popup where you can see the full description of the DL code. The DL codes are also used in STATS page. Insert here your arrival stand. 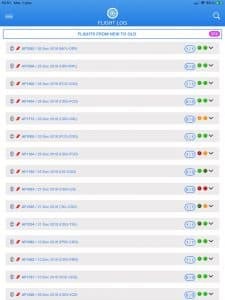 Parking stands are used in STATS page where you can see all stands used, by airport. By taping this icon, your flight times will be auto updated. No more need to log your times ! Clicking this icon will download OUT-IN-OFF-ON times, average delay for this flight number, parking stand, and also tailnumber if empty. You can insert here your RWY used for Takeoff and Landing. These informations are also used in STATS page. Here you can select how many takeoffs and landings you did. By selecting PF/PM you are just setting your takeoff and landing to 1 or 0. Here you can save your personal notes according to a particular flight. the LOCKER icon is used to lock your flight. 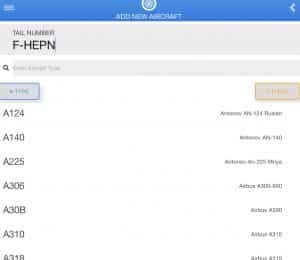 This is a CPT tool to manage your jumpseat requests, ahead of your flight. 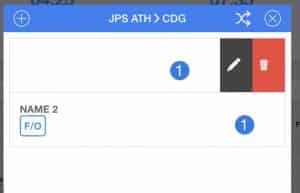 Then you can add (+) a new JPS, delete or edit (swap to the left) and also sort your JPS. DETAILS field is generally used to report your crew names. Tap on the field to edit. Fill the fields Flight Number, From, To, Scheduled OUT, Scheduled IN. The Calendar view is particularly conceived for Air France for duty times. cliquer sur un vol : à chaque clic un scénario s'affiche en haut de page (départ en avance de 5', en retard de 5', vol accéléré, etc) avec le Delta paie. search an aircraft by filling the tail number in the search top bar. This page is accessed either by the (+) button in My Aircrafts page, or by the (+) button in My Flights page. Fill the Tail Number (min 5 digits). or create a new Type. TYPES are IATA main aircrafts for airlines. If you fly on private aircrafts, you'll have to register a new type. By hitting the +TYPE button, you'll display 4 new fields : CODE and DESCRIPTION, and SINGLE ENGINE / SINGLE PILOT. 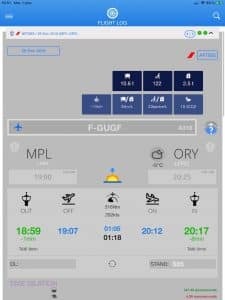 Leaving SINGLE ENGINE or SINGLE PILOT unticked means MULTI ENGINE or MULTI PILOT (Flight time will be automatically logged in the right column). Fill your informations and press SAVE. At the very bottom of the Sync page, press the Dropbox Sync button. SAVE or RESTORE your log (it's like server sync). SAVE will create a new folder in your own Dropbox. In this page you can also DELETE your log (it will erase all your data) by clicking the button. Hitting the CONTACT button will open a popup FEEDBACK window. Fill your message ; if you need to attach your logbook for support purposes, you can activate the toggle. In case of any problem (specifically if you fill any information into any flight and nothing happens), press the CURE button to reindex your flights. In your FlightLog logbook, go to TOOLS > ATMOSPHERE & SPACE. 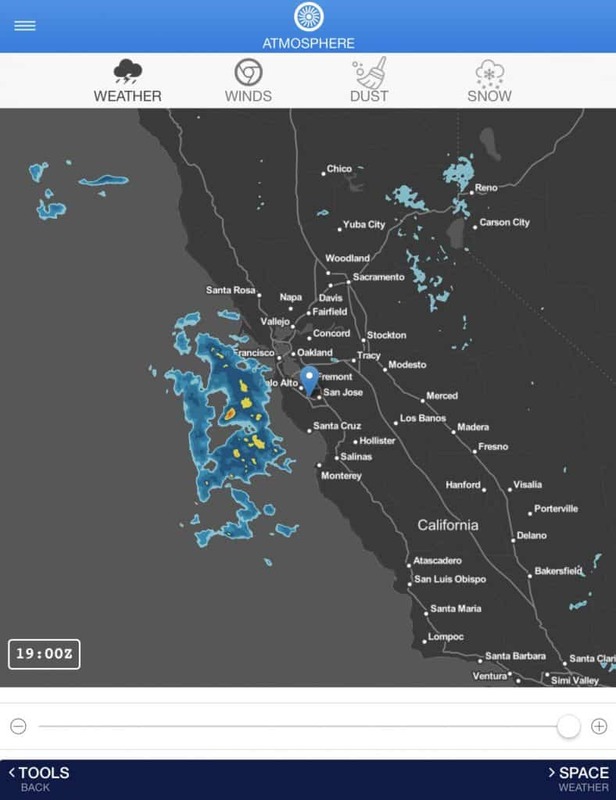 In your logbook go to TOOLS > WEATHER and a weather radar map will be displayed, centered on your GPS location.A slider below shows the image by 10min increments (history = 2hours). 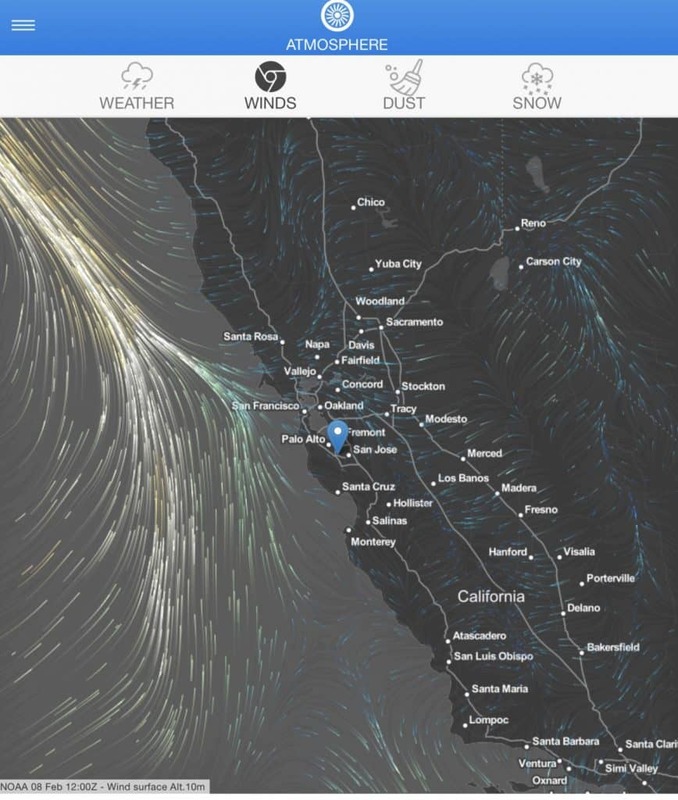 tab WINDS will display an animated winds map at surface level. 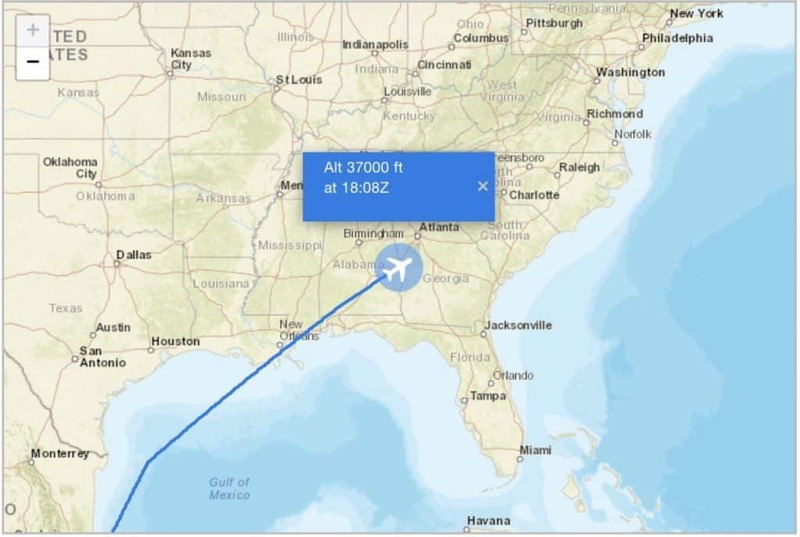 The map is GPS location centered.You can also access to a wind map centered on your flight plan by taping on the sunrise button inside MY FLIGHTS, then ATMOSPHERE. 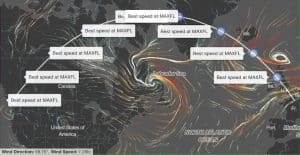 You'll have your flight plan displayed over a wind surface map and best speed flight level calculated (by integrating all the atmosphere column winds between FL200 and FL 450 - even if not displayed).Wind data from NCEP NOAA. 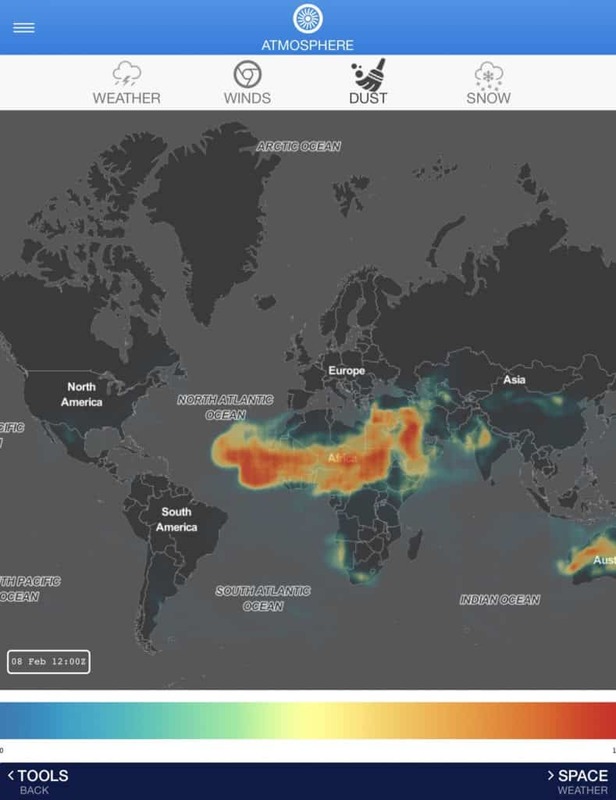 tab DUST will display a dust map (Dust Aerosol Optical Depth at 550nm).Data from COPERNICUS. 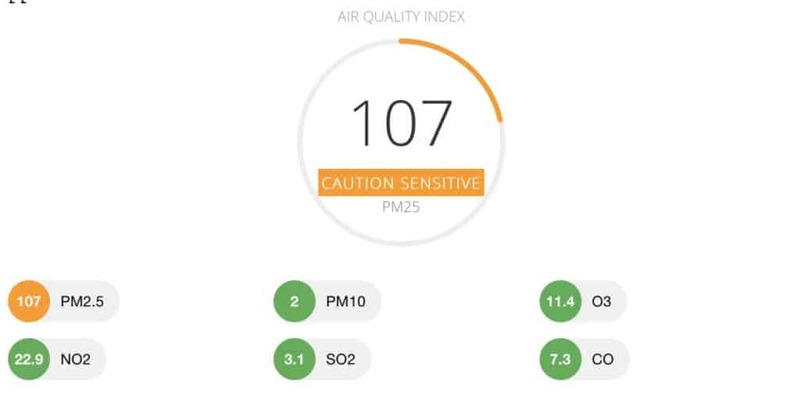 Air Quality, see Air Quality. Space Weather, see Space Weather. The first row is the Space Conditions including RADIO BLACKOUT, SOLAR RADIATION STORMS and GEOMAGNETIC STORMS. 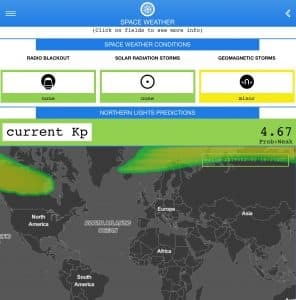 Colors are indicating the storm level -1 to 5 : refer to NOAA SPACE WEATHER SCALES explanations- ), and by taping on any field you'll have the storm's consequences displayed.Below is the CURRENT Kp. 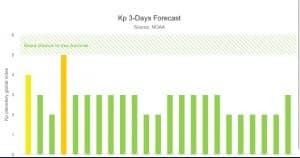 Kp is the planetary index which starts at 0 and as the geomagnetic (aurora) strength increases, so too does the Kp number. 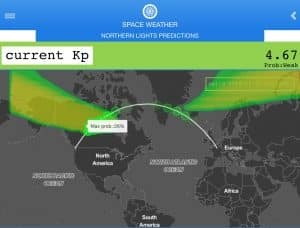 So Kp 0 being a very weak or none existent aurora, right through to 9 being a major geomagnetic storm with auroras likely in France and even Northern Spain. FlightLog is coming with an elaborated Theodolite. Rotate your device to align chevrons with the cross to lock on the horizontal axis (horizontal is actually corrected with the Earth curvature according to the cloud distance) : the cross is showing where you'll fly when you'll reach the distance. Aim for the cloud side then click on the PIN button (top right) to lock the cloud position. Aim for the desired direction you want to fly : it will display the heading and the horizontal margin according to the cloud distance. FlightLog comes within an elaborated Fatigue module. 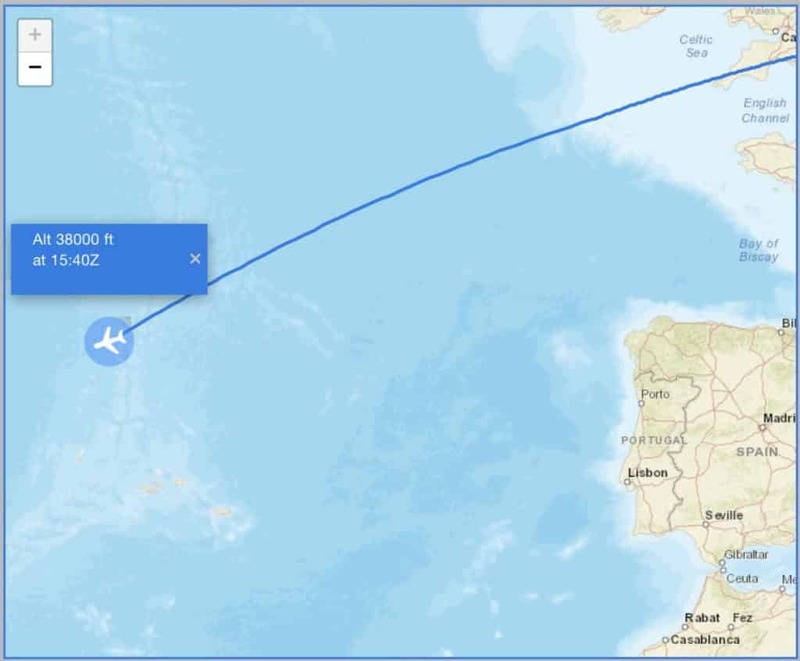 Once your roster is imported, this module will show you all your flights to come. 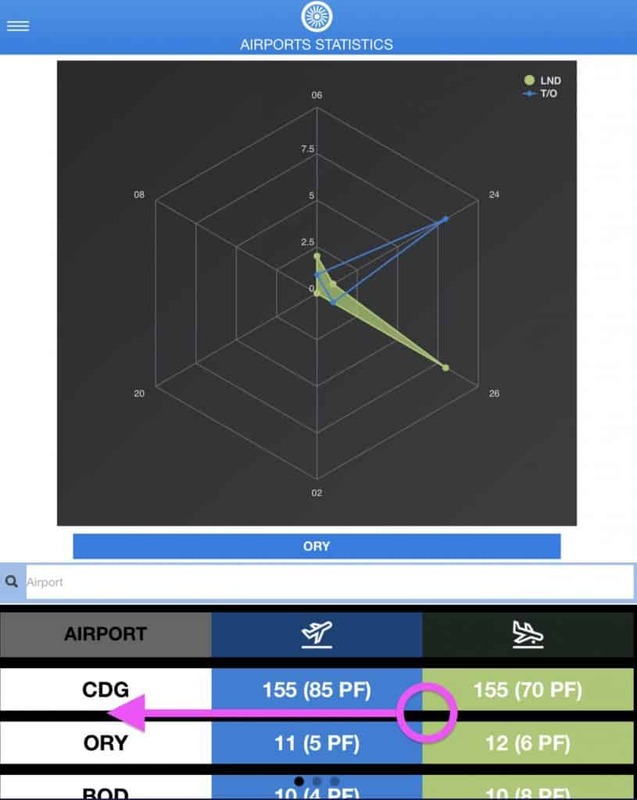 The app is calculating the fatigue caused by your flights, using a bio-mathematical process called Three-Process Model (TPM) of Alertness, elaborated by Akersted. TPM includes a Process C that represents sleepiness due to circadian influences and has a sinusoidal form with an afternoon peak, and a Process S that is an exponential function of the time since awakening. The third Process U that represents a 12-h period is associated with the afternoon reduction in alertness. The model also includes a sleep inertia function (process W) that initially reduces alertness at the time of waking up with an exponential recovery.The duty time is computed as : no sleep allowed 2.5h before flight and 2h after.The model also takes into account the jetlag : we modeled acclimatization to be made continuously, assuming a default daily rate of 30% of the difference between the acclimatized time and local time. Then the model is converted to match the Karolinska Sleepiness Scale (1-9 levels). 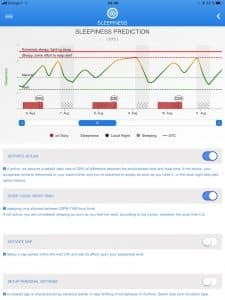 You can setup your personal settings like age and sleeping type, setup your actual alertness level, and play with several options like activate jetlag, local night rest, setting up a nap on your next flight, in order to optimize your alertness at landing time and your rest at destination. Obviously the model, validated for crews (the study was partly funded by Vinnova Sweden (to Stress Research Institute) and partly by Jeppesen AB) is subject to individual differences and applies to 75% of the population. 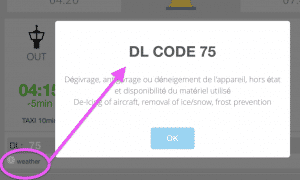 This module will decode all DL codes with IATA definitions. Simply enter your code (2 digits) and full decoded text will be displayed. 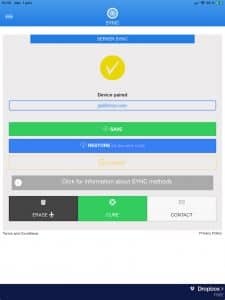 This is a module helping you to calculate your true margin within relief, according to real atmosphere. As real atmosphere differs from standar atmosphere, your true altitude depends on QNH and temperature. set present FL and SAT to calculate ISA T°. Then, lock ISA toggle. In a similar way, true speed depends on altitude : select your IAS indicated airspeed, altitude, QNH and temperature, and read your true airspeed. Simply enter a value in a field and associated converted value will be displayed. 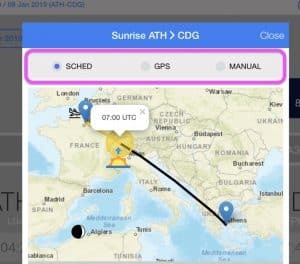 Enter the desired flight number, click the blue button and the app will display the ETA and flight information, and also a map with true location of your aircraft (from ADS-B network) if your flight is airborne. Just like Flightradar24. FlightLog comes with a METAR RWY STATE decoding tool. Simply write your code, your runway state will be displayed. Carbon monoxide poisoning is the most common type of fatal air poisoning in many countries. The greatest sources of CO to outdoor air are cars, trucks and other vehicles or machinery that burn fossil fuels. Carbon monoxide is colorless, odorless, and tasteless, but highly toxic. Particulate matter are fine inhalable particles, with diameters that are generally 2.5 micrometers and smaller. Particles less than 2.5 micrometers in diameter, also known as fine particles or PM2.5, pose the greatest risk to health. Ozone, or trioxygen, is an inorganic molecule with the chemical formula O3 is ground-emitted by cars, power plants, industrial boilers, refineries, chemical plants, and other sources chemically react in the presence of sunlight..There is a great deal of evidence to show that ground-level ozone can harm lung function and irritate the respiratory system. 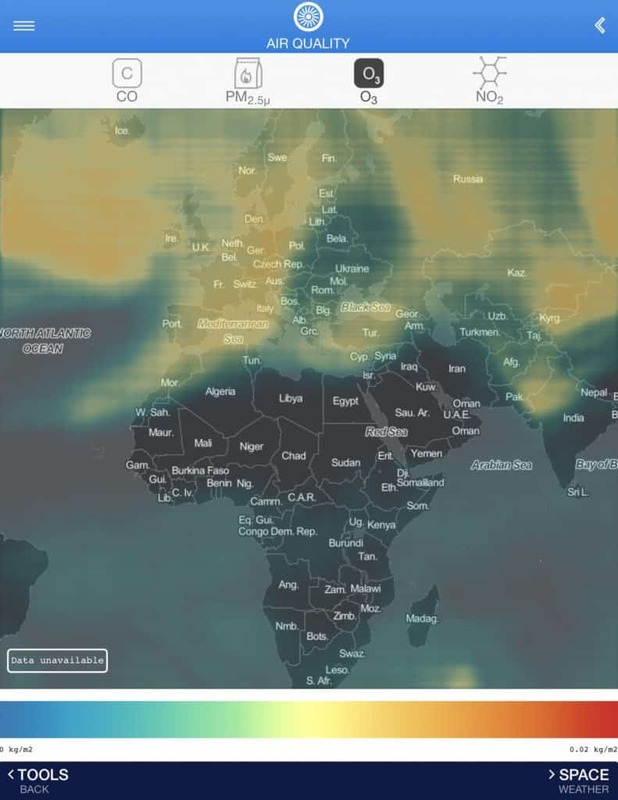 Nitrogen dioxide is introduced into the environment by natural causes, including entry from the stratosphere, bacterial respiration, volcanos, and lightning. These sources make NO2 a trace gas in the atmosphere of Earth, where it plays a role in absorbing sunlight and regulating the chemistry of the troposphere, especially in determining ozone concentrations. NO2 is a reddish brown gas that is emitted from all combustion engines. There are two main nitrogen based compounds that are emitted from combustion engines: NO2 and nitric oxide (NO). Chronic exposure to NO2 can cause respiratory effects including airway inflammation in healthy people and increased respiratory symptoms in people with asthma. NO2 creates ozone which causes eye irritation and exacerbates respiratory conditions, leading to increased visits to emergency departments and hospital admissions for respiratory issues, especially asthma. Sulfur dioxide is a gas. It is invisible and has a nasty, sharp smell. About 99% of the sulfur dioxide in air comes from human sources. 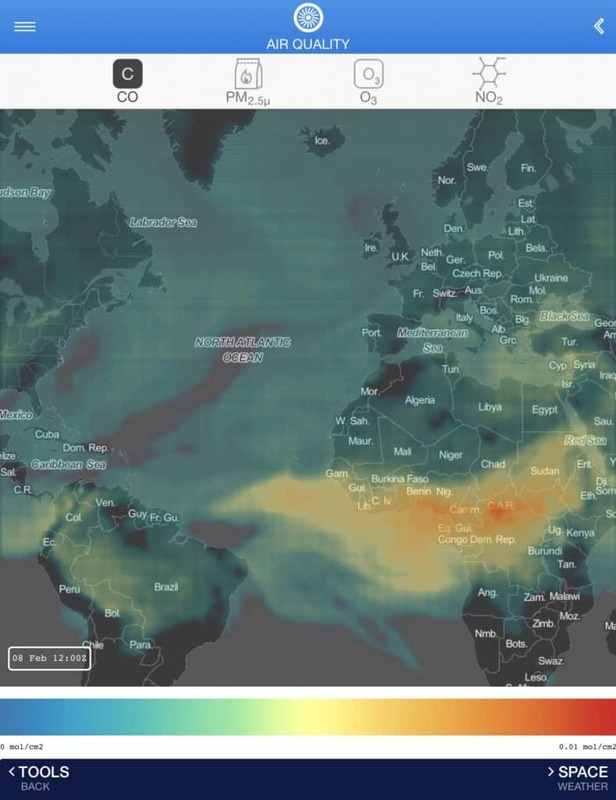 The main source of sulfur dioxide in the air is industrial activity that processes materials that contain sulfur, eg the generation of electricity from coal, oil or gas that contains sulfur.Sulfur dioxide affects human health when it is breathed in. It irritates the nose, throat, and airways to cause coughing, wheezing, shortness of breath, or a tight feeling around the chest. The effects of sulfur dioxide are felt very quickly and most people would feel the worst symptoms in 10 or 15 minutes after breathing it in. 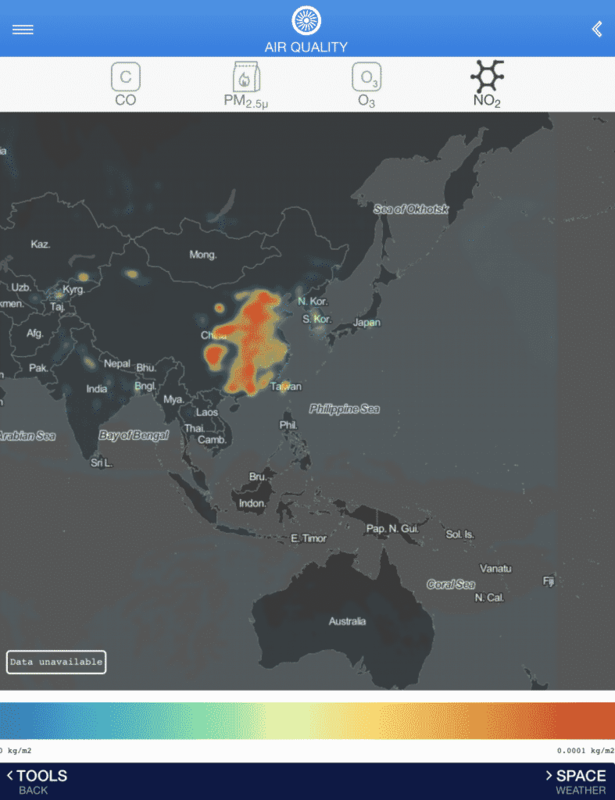 The app shows a global Air Quality Index, calculated by World Air Quality Index following NowCast as defined by the US-EPA 2016 standard : 0(GOOD) to +300(BAD) with the main pollutant. Below are the index related to each pollutant. The number is the AQI according to your GPS location. By taping on the field, you can have detailled source and update data time, as detailed health implications. 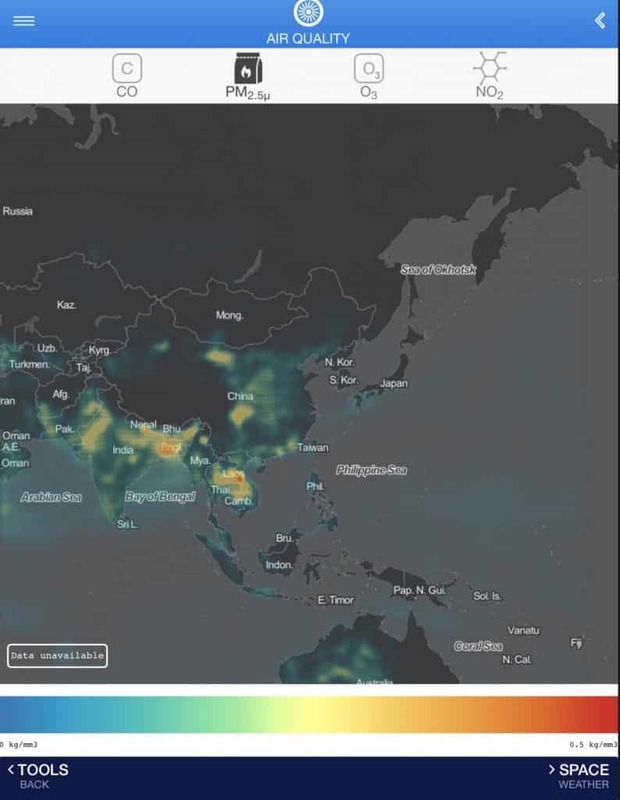 The data comes from 10000 air quality stations around the world. The standard values for limitation is the FTL one (100H within 28days) but you can edit these values by typing on LAST 28 DAYS button and 28 DAYS LIMIT 100H button (below). 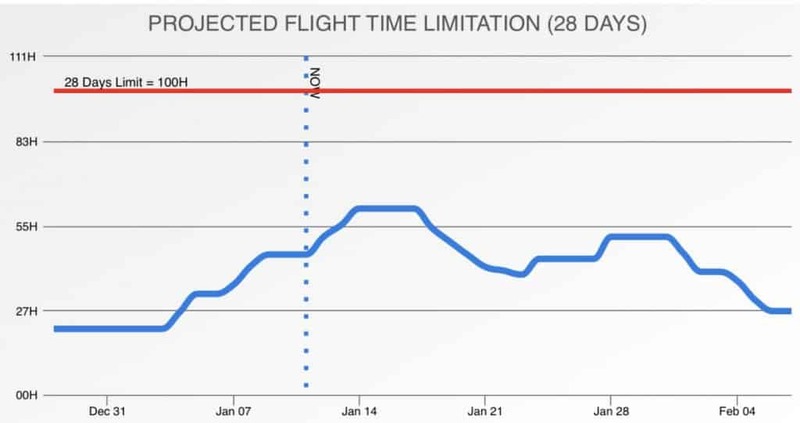 This curve shows your cumuled time since 28 days (or your value), with a projection until next 28 days, as you can be aware of your maximum flight time allowed. This is a simple donut representation of your limitations (28 days, 90 days, and 12 months). You can edit these values by clicking on 28 DAYS LIMIT, 90 DAYS LIMIT and 12 MONTHS LIMIT buttons below. 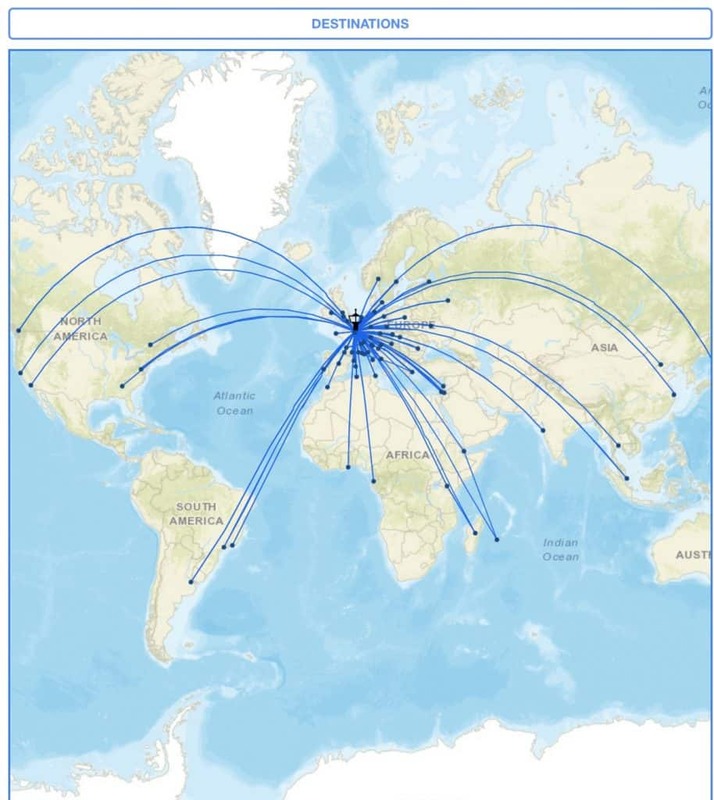 This is a summary of your flights including amazing statistics. The stats are sorted by 28days - 90days - All Time - Current Year/Month. You can edit your 30days/90days/year limit by clicking on these fields. You can see how many liters of fuel per 100km you burned, or how many PAXkm/L did you carry, how many tons of CO2 did you emit. The white bubbles (in the image above the value is 4) represents the numbers of SIM takeoffs and SIM landings. The graph shows your monthly flight time. 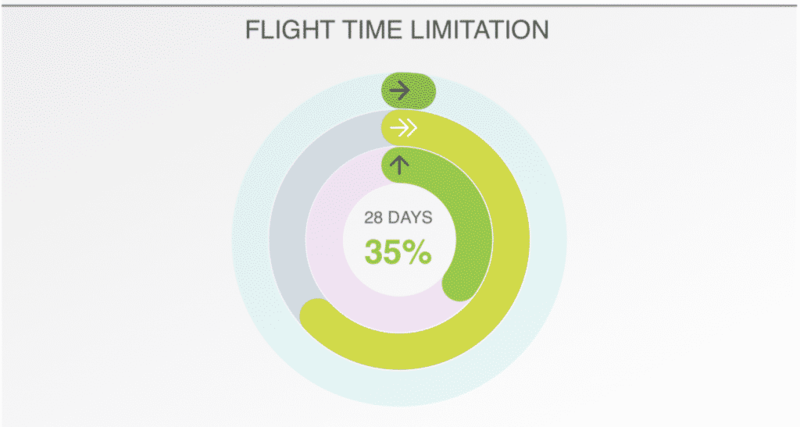 By clicking on the button MONTHLY/YEARLY/TYPE you'll display your flight time accordingly. 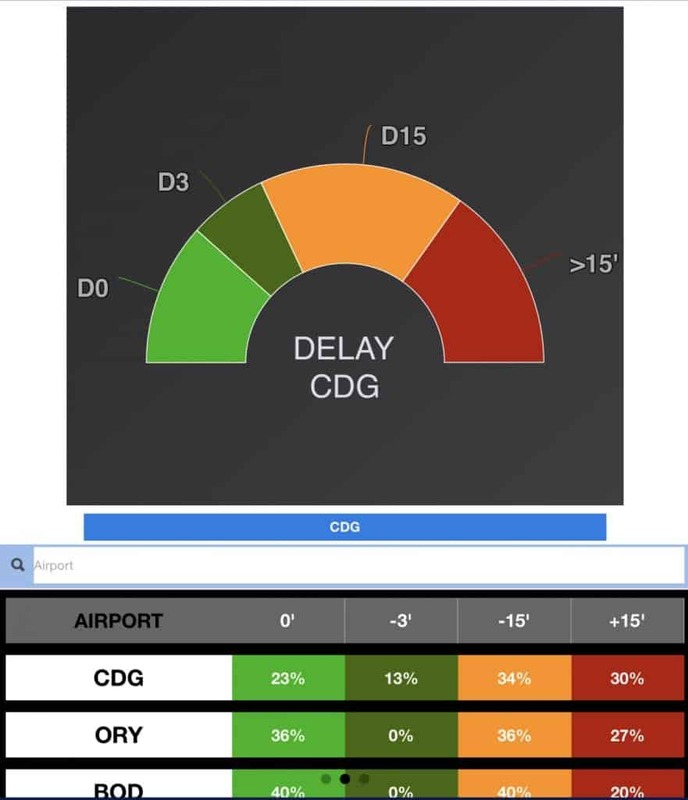 This part represents your global delays on all your flights range. The blue bell curve is the OUT delay, the grey one the IN delay. You can edit your desired range by sliding the left and right handles to change start and end dates. MOST OF THE TIME is the delay more often encountered (in term of number of flights). Not very representative although. AVERAGE : the classic mean. 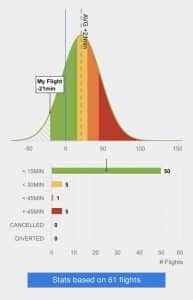 It takes into account all flights, it means if you have 99 flights on time and 1 flight with an excessive delay, your mean will be very impacted. MEDIAN : like a mean, but the extreme values are ignored. This is the more representative value. 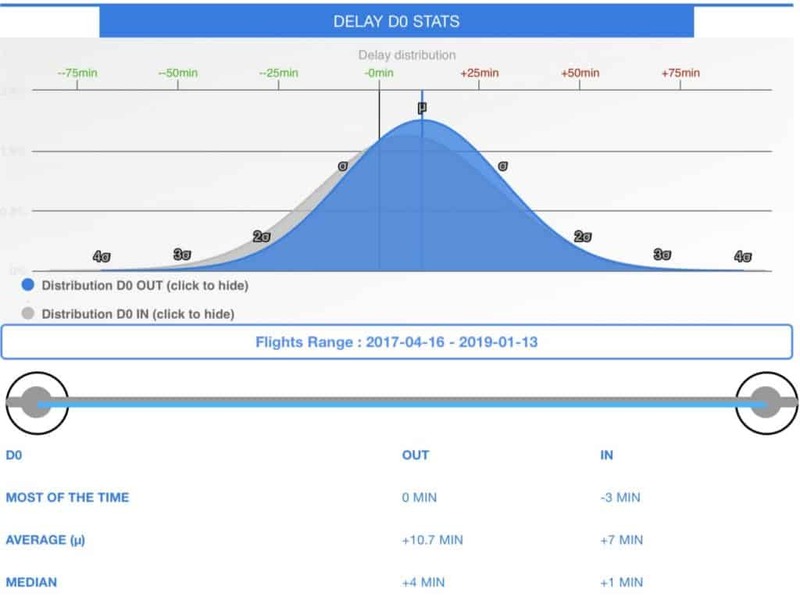 You can here activate the Time Dilation option : time dilation according to Einstein theories will be displayed under each flight and cumulated ones in SUMMARY page. Activating this tab will show extended stats as distance equivalent (earth-sun, year-light --second-light I mean-- etc...) CO2e rejected and radiation dose received. will calculate in batch the total radiation received for all flights, based on block time and fixed altitude of FL370. Be aware clicking this button will erase all your previously computed dose with specific altitude you may have done. will activate the fields IFR/VFR and Night time within each flight.Night time is not calculated, you have to manually fill the data. is only for AF pilots. 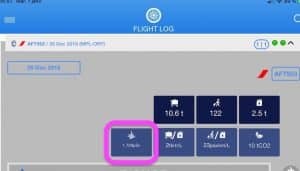 select and fill your previous total of flight hours to take into account your total experience in your flight log. All your destinations are here. The ATC tower shows your main airport. You can access STATS via the SUMMARY page and clicking on STATS> button in the bar. By clicking on an airport you'll display the RWY you used for takeoff and landing. Slide to the left to access to further stats. By the same way, by clicking on airport you'll access to your delay (global and by airport). By sliding to the left again, you can see the outcome of your DL code in terms of minutes. By clicking on Stands button you can see all your parking positions, by airport. Here you can export you logbook in PDF format and print it. The logbook fits the EASA Jeppesen format. Fill your NAME for signature, and press GENERATE. 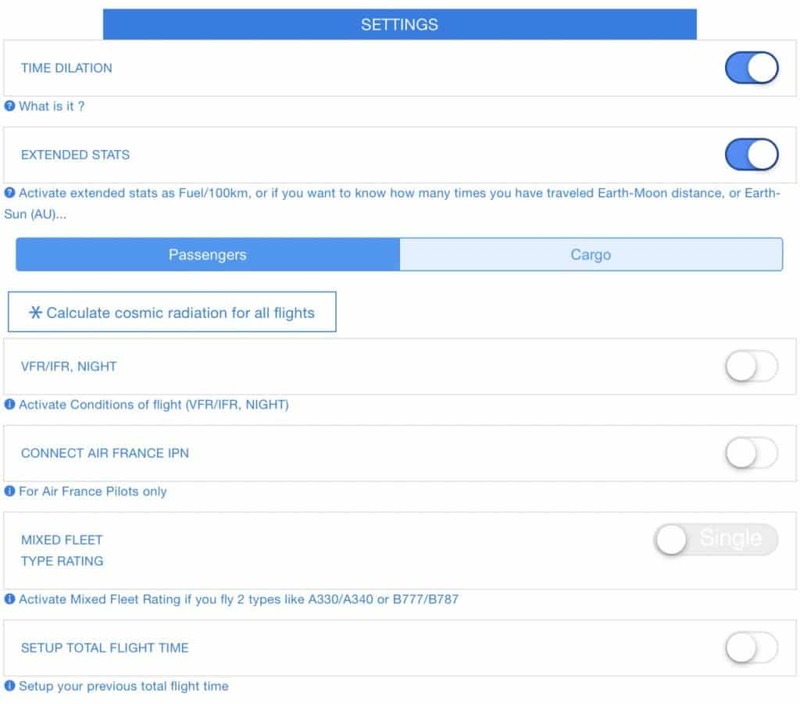 You can import you old logbook into FlightLog in order to have all your flights, although it's not recommended. Importation modules are compatible with LogTen Pro, MCC PilotLog, RosterBuster, PilotLog.uk. Go to SYNC > Dropbox and login with your Dropbox account. 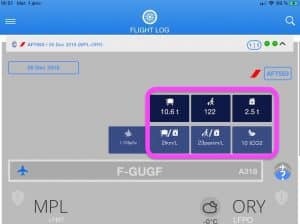 Within your LogTen Pro app (OS or IOS), export your logbook with the following options selected : Export > Export Flights (Tab) and save the file in your Dropbox in the Applications>FlightLog Sync folder (it's better to first SAVE your log in Dropbox as the app will create automatically the folder for you). You can do the same for your aircrafts list (Export Aircraft option). Please check your file is named "Export Flights.txt" or "Export Aircraft.txt". 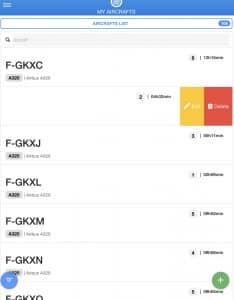 Then in your FlightLog app, go to SYNC tab > Dropbox, and you should see buttons to import flights and aircrafts. If not, please check your exported files are in the right folder. Export your mcc logbook as a CSV file. Rename it as "Export Flights.csv" Save it in your Dropbox in the Applications>FlightLog Sync folder. Export your Rosterbuster logbook as a CSV file. Save as it in your Dropbox (don't rename it) in the Applications>FlightLog Sync folder. Then in your FlightLog app, go to SYNC tab > Dropbox, and you should see buttons to import flights. Your aircrafts will be imported also. If the buttons don't show up, please double check your exported files are in the right folder. If you have an other logbook software, or even your own Excel file, you can try to import it within FlightLog logbook. Export/Convert your logbook in .csv format. Arrange eventually your data to better fit the following format. 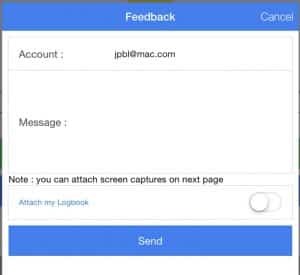 in FlightLog app go to : SYNC>Dropbox and press MANUAL IMPORT. If the button doesn't appear, check that your csv file is in the right folder. Match the right fields then press IMPORT. The blue fields are mandatory. TYPE : "FLIGHT" / "SIMULATOR"
Note : It's not recommended to import your old logbook : stats will not be available and it can generate some bugs as logbooks data are not in same format. It's far more recommended to log your total flight time in SUMMARY tab, under SETTINGS > SETUP TOTAL FLIGHT TIME. What is Time Dilation ? Is it true pilots are traveling in time? Actually, yes, and I'm not talking about jetlag... you can travel in time, not your OWN time of course, but OTHERS' time. This thanks to a concept known as gravitational and velocity time dilation, explained by Einstein’s theories of General and Special relativity. The absolute Time doesn't exist, everyone has his own universe line. As you can travel different distances to go from A to B, you can travel different durations. Depending of your speed and gravity. Your life has always the same duration (for yourself), but not for motionless people. For these people, by travelling you are aging slower. Unfortunately, the time travel experienced by you or an astronaut in International Space Station is so small that it’s hardly noticeable, sometimes even measured by picto seconds - that is, one trillionth, or one millionth of one millionth of a second, or 0,000000000001 seconds. But it is nevertheless time travel, and it will accumulate during the course of your life. This app calculates both. You have just to activate the toggle in SUMMARY/SETTINGS tab. But unfortunatly, you fly at high altitude, 10 kilometers or so, making the gravity weaker than on ground : you are aging more quickly at high altitude than on earth... Gravity slows down the time : did you know Earth's center is two years younger than its surface ? 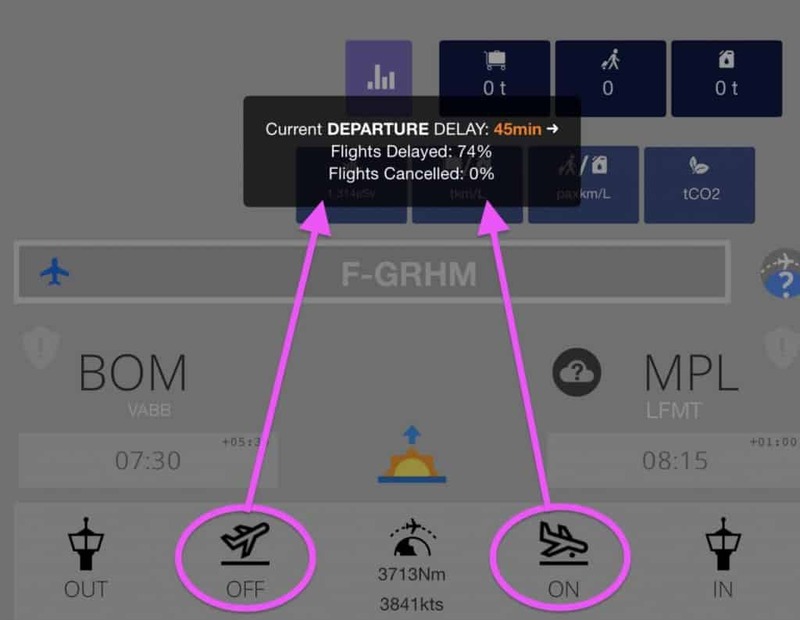 This app will merge these two effects for each flight. 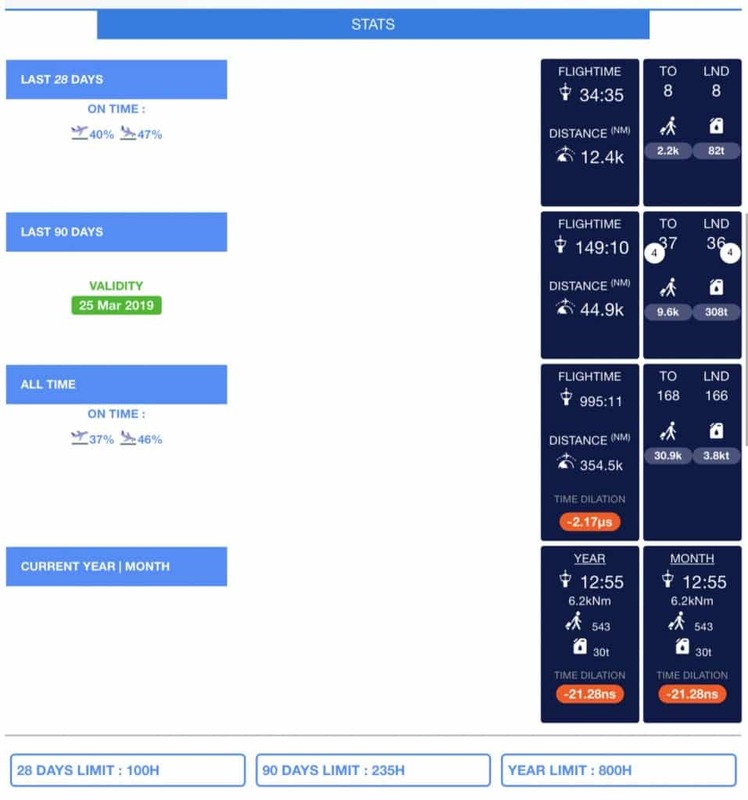 The app calculates the orthodromic distance and your speed to compute the velocity time dilation, taking into account the bearing of flight and the latitude. 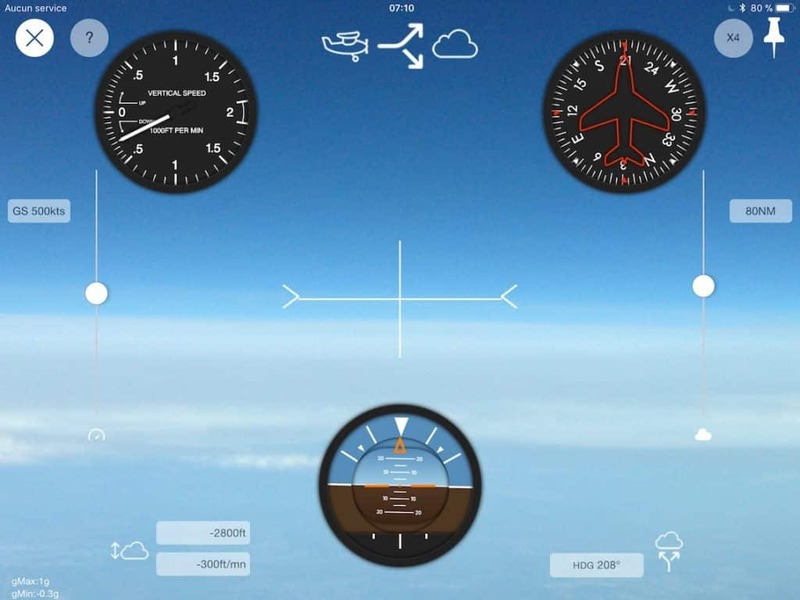 The app also calculate the gravitational time dilation using an average cruising altitude of 11 km. You can check the cumulated effect by month, year, and all time. FlightLog uses open source ressources. 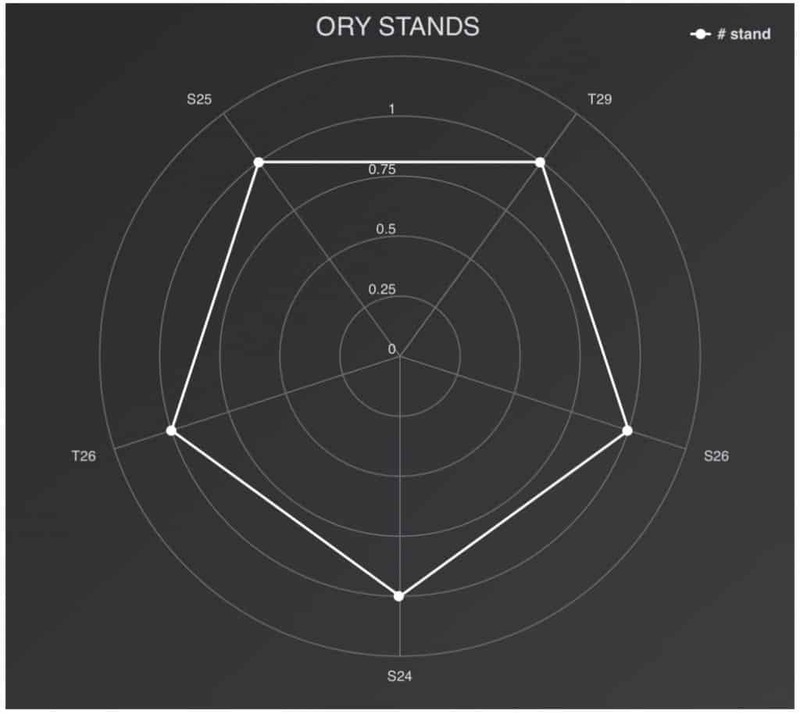 Charts are hand-georeferenced and not up-to-date, from Jeppesen, LIDO or AIP.